Hoverboards still don’t hover. But people are finding some pretty creative ways to use them. 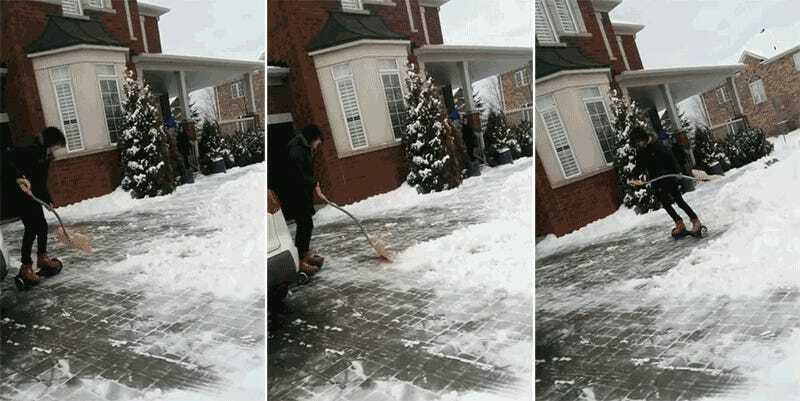 Like this 14-year-old boy who discovered a way to utilize his hoverboard while shoveling snow. The Canadians are calling it “shovering.” And we can’t wait for this teen craze to sweep America. The clever kid is Julius de Paz of Burlington, Ontario. And I’m going to be honest: As a former Minnesotan who has shoveled his fair share of snow, I’m not sure how this guy is getting any traction or leverage to shovel properly. But he is! Apparently it’s not the first time that young Julius has used his hoverboard for household chores. His mom attests to the fact that the ingenious shovering teen has been vacuuming, sweeping, and taking out the trash—all without getting off his hoverboard. It’s probably safer than hover-woodchipping or hover-sawing, but who knows what those crazy teens will think of next. Hoverboards may not hover, but as long as they’re still catching fire and causing head injuries, at least they provide a little danger to a generation of kids who have grown up swaddled in bubble wrap their entire lives.